If there ever was a baby that really wanted to make a grand, dramatic entrance into life....it would be little miss Audrey. Taking her time (a total of about 87 hours from water breaking to arrival), including four hours of pushing for her mama! She didn't disappoint however, as she is one of the sweetest babes there ever was. I get a call from Dalton around 6:30am, Friday May 6th, 2016. Her water broke! There was a sense of urgency yet calmness in his voice as he told me that Sandra was packing for the hospital now, but he was thinking they were going to be sitting at home for a bit. Her contractions were absent, however they started to prepare to leave and decided to head to the hospital around noon. While still in early labor, she was admitted, got a room, and prepared to stay at least the night. I received a text around midnight. They would be starting an induction that morning. Her labor had not progressed much over the night, and with a broken bag of waters, the clock was ticking. Around 630am, Sandra took her first round of oral medication to help jump start her labor. She was allowed to take up to 6 does, every 4 hours, so she prepared for another night in the hospital. The midwives and Sandra both decided not to do any cervical exams to check how dilated she was, as doing so with broken water would be to risk infection. This Mother's Day I had planned a barbecue at my house with just my parents, and the great grandmothers here in town. With the possibility of Sandra's birth, I almost canceled it. However, this time I had a feeling that I should just wait it out, let my family come, and be prepared to leave if need be. This Mother's Day was especially important to us, more so to my grandmother than the rest of us. It was the anniversary of my great grandmother's death, and I didn't want to stop them from gathering, even if that meant I could not be there. So we carried on with our sweet tea and burgers, making sure that I had my phone ringer on high and staying in communication with Sandra all day. Early in the morning, around 2am that Mother's Day, they started Sandra's Epidural. Other oral medications to help her cervix dilate were given about 4 hours later. She continued to labor and sleep off and on all day. 2pm was the first cervical check: 4cms, 100% effaced! This meant that her cervix was soft enough, now she just needed it to dilate. They continued to be patient with her, not rushing the process along, and started doing some pitocin. I get a call around 130am. I began to get ready around 2am to leave and make the drive to Denver, which is more than an hour north of me. I arrived to a lovely, sleepy couple around 33oam. I met with her lovely nurse who just so happened to also be one of her best friends, snapped a few images, and snuggled up in a chair in their hospital suite for a nap. When I woke up, I went down stairs for a bite to eat. 630am, I came back to hear that she was dilated to 9cms! She had made excellent progress. Sandra guesses that the time of birth would be 12:06pm. 830am Julianne was no longer her nurse, yet stayed to support her as a doula and as a friend. She began to read from the bible: Phillipians 4, and Isaiah 26:3. She only had a small lip of cervix left as lunch time approached, and around 4pm she was starting to push! For about an hour she pushed, and then the midwife suggested a bit of a tug of war. They attached the squat bar and draped a sheet over it for her to pull on while she pushed down. After about an hour of that, she began to push on hands and knees, and it seemed to be much more effective. Watching this woman work so hard on bringing her baby earthside, was breathtaking. It is always such a beautiful sight to witness a woman dig deep into her being and put every bit of strength that she has out on the table for everyone to marvel at. After 4 hours of aggressive pushing, Sandra was growing tired. An obstetrician was asked to be present in the room, and a vaginal check was done by her to get a full understanding of the situation. She determined that the baby was not breech, yet she was just facing the opposite direction, which can make pushing very hard. She also determined that the baby's head was slightly too big for Sandra to push her out on her own, and that the best option would be cesarean. Hearing this news broke Sandra's heart. I think it broke all of our hearts, after seeing how determined she had been to have a vaginal delivery. However, this amazing story doesn't stop there, cesareans are increasingly more and more family oriented and beautiful. 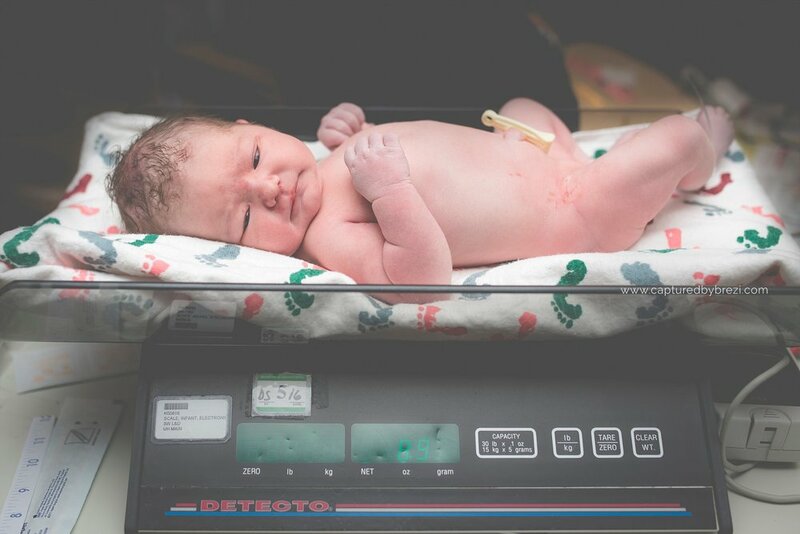 It was important to her to have her birth documented, and of course I always do everything I can in a case of an unexpected cesarean to be able to be present in the OR. 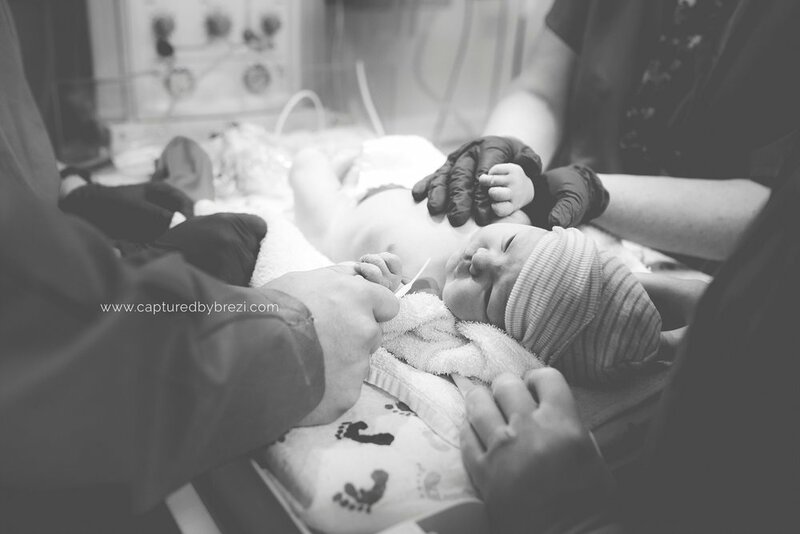 I believe that birth photography, especially in the case of an unexpected cesarean can be an invaluable tool to the healing process. So of course, I asked the charge nurse and they were so wonderful and accommodating in relaying the message to the rest of the team in the OR and in the end I was allowed in! Little Audrey was born via cesarean just after 9pm that Monday, May 9th. She was completely and utterly worth every second of the wait. Here's a few thoughts from the hard working mama herself about her beautiful birth experience. . . Even though I didn't have her vaginally I feel like I got to experience some great things like having the mirror allowed me to see her head which was pretty neat. Trying the different positions I felt God's overwhelming strength in those moments."